Ubisoft yesterday released Assassin's Creed Identity for iPhone and iPad worldwide, following news of its highly anticipated official launch earlier this month. 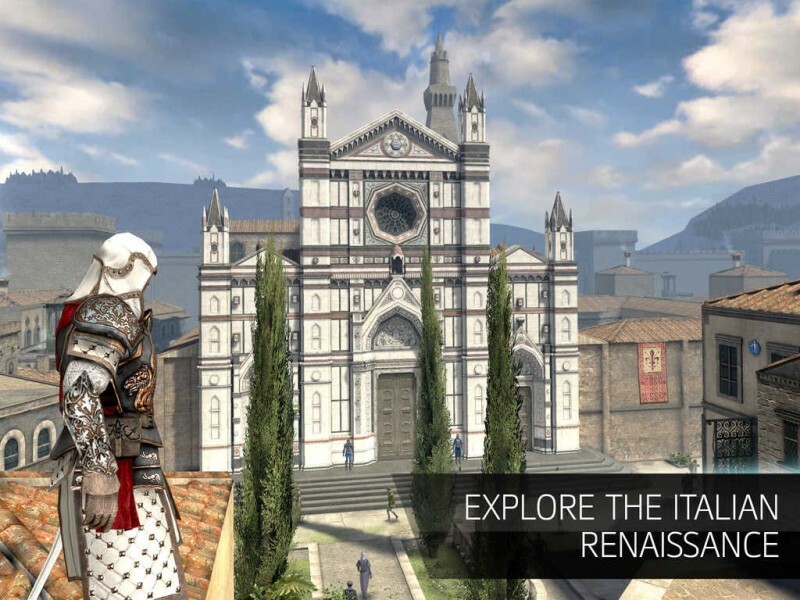 The popular action role-playing game lets you create, customize, and play as Assassins during the Italian Renaissance, with story missions and quests set in the Coliseum, Florence, and other key locations of the era. The game features three classes of assassin, open sandbox levels, and various customization options. And in a first for the franchise on iOS, Identity also allows full freedom of movement, which means players can run, jump and climb their way around the game world as they take on quests and explore various locations. While the Assassin's Creed brand has been on mobile in several iterations before, Identity is the first "true" Assassin's Creed mobile game to mimic the play style of the popular console and PC games. The saga began when Identity soft-launched in select countries way back in September of 2014. The game was built around quick missions that felt conducive to mobile play but it was the first Assassin's Creed game on iOS to be built around the more traiditional open-world mechanics of the long-running console and PC game series. It was also a very free to play game with all the trappings that comes with, which just didn't jive well with the type of game that it was. Assassin's Creed Identity remained in soft-launch all the way up until late last month, when it disappeared from the App Store without warning. Just a few days later it was announced that Assassin's Creed Identity had been reconfigured as a paid title and would at long last be officially launching on February 25th. Optimized for iPhone 5, iPad 3 and newer devices running iOS 7.0 or later, Assassin's Creed: Identity is available on the App Store for $4.99. You can learn more about Assassin's Creed and other iOS games at TouchArcade. Is it on appletv? I have no interest in a handheld version. Well, since it's made by Ubisoft I expect 2 things. 1: it's full of bugs, and 2: ALL THE MICROTRANSACTIONS. I'd get a console like that for my kids when they're older. $100 cheaper and the games would probably cost in the $20-30 range at most. The App Store is generally more kid-friendly as well. Great for families and casual living room use. I'm enjoying my 4th gen so far and would love to see it take the next step. First party controller bundles would mean that anything in the "premium" store would need to support controllers. Right now support is really iffy. As for me, I'll stick to my Fallout and Halo on the Xbox One when I really want to game. I just think the ATV needs a little more horsepower to do lower-end ports of current console games. Right now it's kinda stuck in simple clicky games hell. Although big part of that problem is the whole controller situation. Don't get me wrong, I completely get what you're saying. It's probably a viable choice for someone all-in Apple's ecosystem. The only other thing we'd disagree on is the App Store being a more kid-friendly/family-casual environment. Maybe because we're discussing AAA titles that's the mindset used to gauge the kid/family aspect? Dunno. Rest assured both app stores are equally family/casual accessible. The only downside is the $60 year for multiplayer. I don't know anyone who's ever paid full price for a sub, but the sub price is $60. You're 100% right about ATV needing more hp for even low end ports. More than the hp, it will need a more substantial HD. I'm sure there will be some cloud dependency, but the size of titles worthy of $20-30 is going to be pretty massive relative to the 64GB you mentioned earlier. Apple tends to (at least they used to) prioritize UX. Cloud dependency on big titles? You'll have to pardon my skepticism. If they want kickstart more robust gaming on the ATV, the first priority will be getting rid of the requirement for the game to work with the remote. As long as that's a requirement, Apple is effectively hamstringing the development of more appealing titles. The Siri remote as a least common denominator sets the bar pretty darn low for a dev. Not exactly. I still believe there should be something in every Apple TV supported app that gives the user something to do with the remote. Your post seems to say apps shouldn't be required to support the remote at all if they don't want (exception of global system features like Siri, Sleep, and Muti-tasking). You're right. We do differ there. I view the remote requirement for gaming in a similar vein with Microsoft's insistence on the Kinect being a part of the XB1. It was an idea they still regret. The remote does fine as a remote. I'm of the belief that you should always use the right tool for the right job. Phone type games that don't require complex controls? Fine for the remote. Dumbing down the controls of a AAA title to accommodate the remote? Outside of navigating the menu's, I just don't see the advantage for the gamer or the game maker. Differing opinions. It's all good. This game doesn't appear to be rushed, Ubisoft isn't necessarily known for bugs...rushed games are. And ehh, Ubi isn't that bad with the microtransactions either. "The New iPad" - god I hated that name. Ive been a fan of the series since the beginning even playing the psp titles. After being massively being let down with the bugs of Black flag and then the disappointment that was Unity. I skipped on Syndicate and will definitely skip this ios versiom as well. The story went downhill after the last Ezio game. Bugs. It's the reason I have learned to not purchase release month games. 2nd quarter or later. Black Flag was great after the fixes. Unity... let's pretend that game didn't happen. Syndicate is the apology for Unity. It's pretty darn good. I wonder if games like these make money on mobile. I'm actually disappointed 4.99 -19.99 games and apps do so poorly. Just goes to show you the percentage of misers out there. I heard the top paid app only sells about 15,000 a day on average with about a billion iOS devices out there. Than you see people complaining about micro transactions.